We all sometimes lose something. A lost thing can be very dear to our heart, especially if it was presented as a gift or if a lot of memories are associated with it. Unfortunately, the rings are also lost from time to time. Popular wisdom says that this is not an accident. Decorations of round shape have long been considered not simple objects. They were used for love spells, targeting damage and other rites. They attributed the properties of amulets, and they also believed that the owner’s energy could be transmitted through them, since the round shape preserves it better than any other. It is believed that losing the ring is a bad omen. Together with him, the owner loses part of his energy and vitality. Particularly attentively, popular wisdom advises to treat silver and gold jewelry. A knowledgeable and ill-minded person, knowing who owns the lost thing, can thus bring damage. If the lost decoration was gold, it was said that luck turned away from the person. It was possible to fix it this way: a close, sincere person was asked to make up for the loss with a whole new ring presented with all his heart. Then it took over the function of the amulet, and it was believed that the negative effects were neutralized. There are encouraging signs associated with such a loss. If the ring was gone at the moment when its owner was pursued by incessant troubles, then they believed that together with the lost decoration they would also leave him. 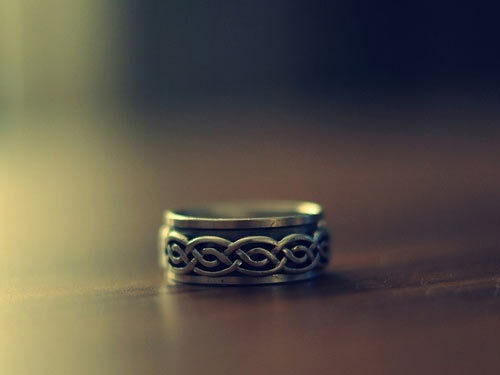 To lose a wedding ring is considered to be a particularly bad sign, as it is a deeply symbolic thing, indicating a strong bond between two people. If one of the spouses made such a mistake, it can lead to difficulties in mutual understanding, to discord in the family and other problems, up to divorce. Influence fate is still possible. First, knowledgeable people advise once again carefully look for home decoration. Put a saucer on a kitchen table or in some secluded place, pour some milk into it and place something tasty next to it. Sometimes beautiful and small things can drag away the Brownie. With your offering you will coax him, and he will return what he has taken: a lost thing will soon be found. If this does happen, in no case can you buy one wedding jewelery — you need to change both. Accordingly, the one who has not lost the ring should still remove it and replace it. The remaining ring is better to carry to church. Do not regret it: having lost your couple, it will not bring you happiness anyway, and donation will purify it and respond well to you in the future. Before you make it, read the obrezhnye words above the ring, first placing a candle next to it. “Where the ring went, there and quarrels went. Where the ring went, the misfortunes went there. Amen». Sometimes lost jewelry can still be found. If this happens to your ring, you can only rejoice: firstly, your jewel is with you again, and secondly, this way it has saved you from harm.